Prof. Shuji Hashimoto received the B.S., M.S. and Dr. Eng. in Applied Physics from Waseda University, Tokyo, Japan, in 1970, 1973 and 1977, respectively. 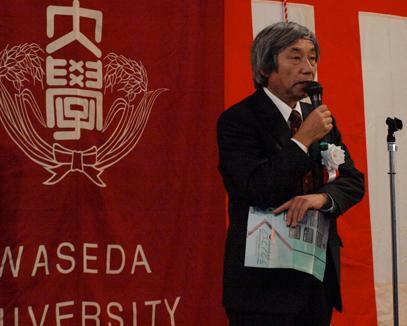 He is a Professor in the Department of Applied Physics and curently he is the Vice President of Waseda University. From 2006 to 2010 he was the Dean and Senior Dean at School of Science and Engineering. He is also a director of the Humanoid Robotics Institute, Waseda University from 2000 to 2010. He has published over 500 technical publications, proceedings, editorials and books. His research interests are including human communication and “KANSEI” information processing are including: image processing, music systems, neural computing and humanoid robotics. He is a member of the Institute of Electrical and Electronic Engineers (IEEE), the Institute of Electronics, the Information and Communication Engineers (IEICE), the Society of Instrument and Control Engineers (SICE), the Robotics Society of Japan (RSJ) and other major societies.